The final conference committee agreement of the Tax Cuts and Jobs Act (TCJA) would cost $1.46 trillion under conventional scoring and over $1 trillion on a dynamic basis over ten years, leading debt to rise to between 95 percent and 98 percent of Gross Domestic Product (GDP) by 2027 (compared to 91 percent under current law). However, the bill also includes a number of expirations and long-delayed tax hikes meant to reduce the official cost of the bill. These expirations and delays hide $570 billion to $725 billion of potential further costs, which could ultimately increase the cost of the bill to $2.0 trillion to $2.2 trillion (before interest) on a conventional basis or roughly $1.5 trillion to $1.7 trillion on a dynamic basis over a decade. As a result, debt would rise to between 98 percent and 100 percent of GDP by 2027. Ignoring the expirations in this bill is particularly disingenuous given the claim that using a “current policy baseline” reduces the bill’s costs. The (flawed) idea is that the bill should be compared to a current policy baseline that counts expired and expiring provisions as if they are continued permanently. (For more on this, see Current Policy Gimmick Would Add Half-Trillion to Debt). Using such a construct does not make sense if cost of continuing future expirations contained in the bill are not included in the initial cost estimate. Policymakers are effectively claiming $450 billion of current policy savings while ignoring over $700 billion of current policy costs. This latest estimate updates our tally of the gimmicks from a previous version of the bill. The changes made in conference include both tax increases and decreases that mostly offset each other, with a net increase in the ten-year cost of $9 billion (compared to the Senate bill). With these changes, the bill now has a total cost of $1.46 trillion, or roughly $1.77 trillion with interest. While there is no new dynamic score of the bill, assuming it continues to produce very roughly $400 billion of dynamic feedback would reduce that cost to about $1.05 trillion, or roughly $1.30 trillion with interest. However, this cost does not account for as much as $725 billion of potential gimmicks that the conferenced bill contains. In the earlier version passed by the Senate, we identified $585 billion of arbitrary sunsets and sunrises of certain provisions. Most significantly, nearly all of the individual income tax provisions would have expired after 2025. Additionally, the expensing provisions ("bonus depreciation") began to phase down starting in 2022, and a number of new tax increases appeared in 2026. Some provisions were set to expire even earlier, such as an expanded deduction for medical expenses and provisions for craft beer and paid leave – clearly setting the stage for future extensions. The conferenced bill adds to the Senate bill's gimmicks, which we explain here. Most significantly, it advances the start date of the bill's requirement for research expenses to be amortized, which nearly doubles the ten-year savings of the provision. Additionally, the bill tightens its limits on the business interest deduction four years in the future – a future tax hike that may not be allowed to ever occur. Other changes are smaller and move in both directions. Adding these gimmicks to the cost of the bill would increase the total cost to $2.0 trillion to $2.2 trillion. Though the dynamic effect of making the bill permanent is unknown, we estimate a permanent bill would produce roughly $450 billion of feedback,* leading to a dynamic cost of roughly $1.6 trillion to $1.7 trillion. With interest, these costs would rise to $2.4 trillion to $2.5 trillion, or $1.9 trillion to $2 trillion with dynamic effects included, over a decade. Source: CRFB calculations based on Joint Committee on Taxation. †High end of the cost assumes these late-stage tax increases are not allowed to take effect. As is, the bill would cause debt to increase from 77 percent of GDP this year to 95 percent or 98 percent of GDP by 2027, depending on whether dynamic effects are included, as compared to 91 percent projected under current law. If expiring provisions are extended and late-stage tax hikes avoided, debt could reach as high as 98 percent or 100 percent of GDP by 2027. In other words, the national debt could exceed the size of the economy. 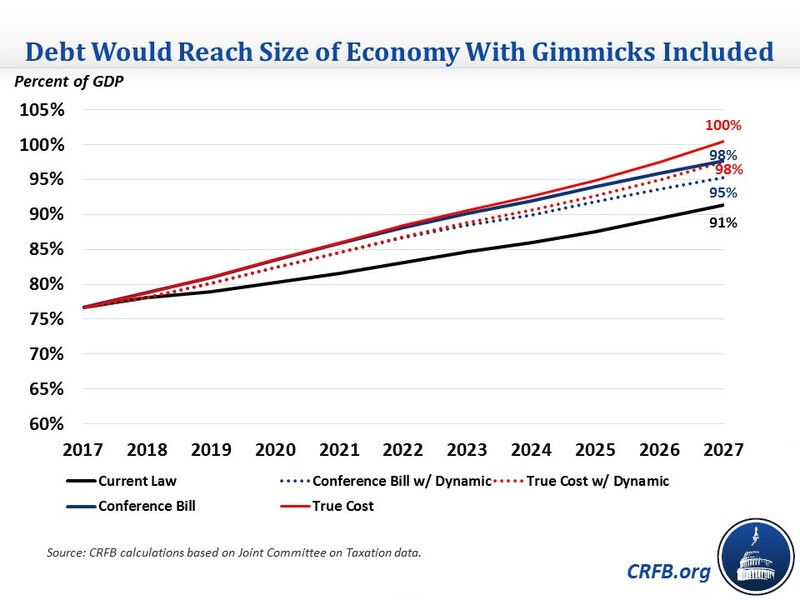 *JCT estimated the Finance Committee-passed tax bill would generate $407 billion of dynamic feedback, and we believe the conference bill would generate a similar amount. Making the legislation permanent could produce more or less dynamic feedback. On the one hand, permanent individual reforms will improve labor force incentives in 2026 and 2027 and will improve investment incentives for “pass-through” businesses throughout the budget window. On the other hand, higher debt might increase interest rates and slow growth. Continued expensing beyond 2022 would increase investment late in the decade but might actually reduce investment early in the decade. On net, we believe the result of these and other factors would be more growth and dynamic feedback over ten years but less (and possibly negative) growth over the long run. As a simplifying assumption, we assume the feedback in 2025 continues through 2027 and thus generates $450 billion of net feedback. Actual numbers could differ.